Rich Olsen, a resident of Beaufort, N.C.receives a hand-carved wooden megalodon shark tooth plaque in recognition of his retirement from the Aurora Fossil Museum Board of Directors. For over two decades, Rich has served the museum in various roles including as a volunteer, the Museum Curator, and Board Chairman. Rich also donated many fossil and mineral specimens, some of which are currently on display in the museum’s Learning Center. 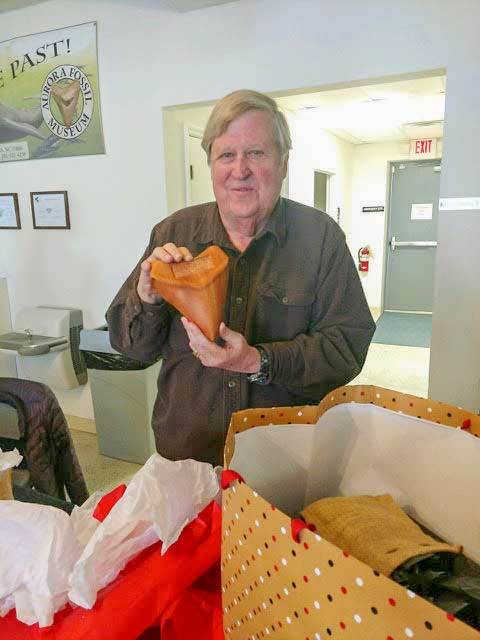 The Aurora Fossil Museum Foundation, Inc. Staff and Board of Directors thank Rich Olsen for his dedication and service.